Watching the movie P.S. I Love You on TV. About 40 minutes in I break into a major crying jag. First, the movie is really, really, sad. It’s about a young couple who have been married 9 years when the man gets a brain tumor and dies. Shortly after, on the woman’s 30th birthday, she learns that her dead husband has arranged for her to receive letters from him at various intervals for the foreseeable future. It was at the memorial service scene where I broke down. Nobody close to me as died recently, so why did it affect me so strongly? I felt the pain and emptiness that comes with the loss of – someone in my life. It doesn’t take a death to cause that feeling. There are many losses that can hurt just as deeply. I watched the movie the day after I had been locked out of my apartment because of an apartment fire in another unit in the building. I had not been home at the time of the fire and by the time I got home the fire had been put out and all emergency personnel had left the scene. I didn’t have any idea anything had happened while I was away. There were no notices posted anywhere and I had not received a phone call or an email. I had no clue. I found out about the fire because my garage door wouldn’t open. I keep the privacy lock on at my front door because I always come and go through my garage. My apartment was locked down from the inside. I called the after hours maintenance contact, who filled me in about the fire and said that power had been cut off to my garage. Nice. To top it off, instead of coming out to take care of my issue, Maintenance Guy sent an office resource to handle the job, and after an hour and a half, Office Boy had made no progress and had headed off to some undisclosed location to get something, and after ten minutes had not returned. So I called the after hours number again and left the message that it was after midnight so I was getting myself a hotel room and would present them with the invoice in the morning. At around 7 a.m. the next morning I drove back to my apartment to see if they had by some miracle figured out how to open my garage door. They hadn’t. The leasing office at my complex normally opens at 9:00 a.m. during the week. I stopped by the leasing office to see if someone may have come in early to manage my issue. Nope. I drove back to my hotel, had breakfast, and then left a message with the leasing office asking that they call me as they are in so they could share with me their plan of action. Nobody called. I drove back to the office at 9. When one of the other office staff members greeted me at the door I stated my name and apartment number. No recognition. I explained that I had been locked out of my apartment all night and stayed in a hotel. I handed her the invoice. Across the room I saw Office Boy. He clearly had not told anyone what had happened the night before. Neither had Maintenance Guy. Really? I was told I would have to wait to see the Office Manager because she was currently speaking with another tenant who had been affected by the fire. The tenant lived in the apartment below the unit where the fire occurred. She had experienced water damage. But she had still been able to get into her apartment and sleep in her own bed. When I was ushered over to Office Manager, I shoved the hotel invoice at her and told her my story. She apologized profusely. She had had no idea this had happened. Clearly, but there was no excuse for that. She offered to have the amount of my hotel stay deducted from my next month’s rent. “Not acceptable,” I told her. I had just paid my rent for the month and wasn’t interested in waiting around for a month to get my money back. She said she would have to call “Corporate” and she would do her best to get me what I wanted. I left the office still angry and feeling patronized…but also feeling something else. Helplessness…neglect. I had showered at the hotel, but had had to dress in the same clothes from the day before – don’t ask about my underwear. I couldn’t go to work that way. What was I supposed to do? Fast forward to the end of the day. I spoke with a lawyer who said I should take the offer to credit the hotel bill against my next month’s rent. Sigh. But, good news (relatively speaking), I have a brand new garage door opener (something about “the event” had damaged the wiring in the previous opener). And the leasing office’s Corporate office approved an immediate refund of my hotel expense. Vindication. Back to the movie which I’m watching at the end of a day of feeling angry, patronized, frustrated and…helpless. So of course I would be a little extra emotional watching a very sad movie. But it’s more than that. What had this story of loss triggered inside of me? Which wound had it ripped open, jagged edges inflamed and leaking fresh blood? The feeling was so familiar. It was the sense of helplessness on being locked out of my home twice while living with my alcoholic boyfriend because he was passed out drunk inside and had locked the house from the inside. Both times there was nothing I could do to get in except break a window, which would have wakened the neighborhood, or call the police (which would also wake the neighborhood and also intensify the sense of humiliation associated with the situation.) I chose to find another place to spend the night. It was the hurt of knowing that no matter how much love I showed my boyfriend and how genuinely loving and caring he was toward me when he was sober, he was still willing to lie to me when he was drunk. He would lie about being drunk and never lost his determination to defend himself against all reason. It felt insulting to me. It was also the sense of loss I felt after finally leaving my alcoholic boyfriend and then attempting to remain friends with him so I can support him through his journey to sobriety…something he wasn’t willing to do while I was still the romantic interest in his life. There is still a big hole in my soul for losing my best friend to alcohol. It’s a hole I’ve been reluctant to try to fill again. I have had one date in the year and a half since I moved out. I just don’t have it in me to go another round. I guess I have some work to do myself. Have you ever used a Neti Pot ? What’s a Neti Pot you ask? Well, a Neti Pot (sometimes spelled “Netti”) is a small plastic pot (or it could be ceramic or metal) that’s used to rinse your nasal passages. The idea is to wash away mucus buildup and soothe irritated nasal passages in a more natural way. I had heard about them from several people before I broke down and bought one of my own. I have found that when used regularly it really does make a difference! I typically have my worst trouble with allergies in the Fall…I think it’s the ragweed that does me in. But this Fall has been extremely easy for me in that respect. While I did take Zyrtec off and on for a couple weeks back in August (before I started using my neti), I haven’t had any since then. In past seasons I’ve had to take allergy meds consistently from late Summer until the dead of Winter. 2. Add some salt and stir until dissolved. Sea salt is recommended, but some manufacturers will include a supply of salt with the Neti Pot with your purchase. I use the SinuCleanse brand pot, which comes with a good supply of saline powder packets. 4. Blow the water out of the nostril you began with. 5. Repeat #’s 3 &amp; 4 with the other nostril. 1. Breathe with your mouth open. If you don’t, you’ll end up with a bunch of salty water leaking from your sinuses into the back of your throat. Sometimes even with my mouth open I’ll have some leakage, but I’m getting better at learning how to breathe. 2. Don’t snort the solution into your nose. That would be bad. I guarantee that if you do you’ll be very sorry. 4. I’ve also noticed that my left sinus passage is typically more swollen than the right and that if I rinse my right sinus first, then try the left, I’m more likely to experience burning in the left nostril. But if I start with my left, that doesn’t happen. As I’ve mentioned, I use the SinuCleanse brand pot. I bought it at Walgreens, on sale for $14.99. I’m on my second neti. My first one met a horrible demise…I dropped it into the toilet one morning as I was loading it with salt before getting into the shower. Sure, I had to reach in to pluck it out, and, yes, I could have run it through the dishwasher and it probably would have been just fine…but I just couldn’t bring myself to use it again after that. That brings up another thing. In all the demos I’ve seen I’ve never heard it suggested that you could use it in the shower, but that’s actually my preferred place/time to use it. I typically use it only once a day, so I figure…why not use it in the shower? I’ve already got my makeup off, and if anything goes wrong, I won’t have to change my clothes! And speaking of frequency, because this method is drug-free, you can use it as often as you need. There are lots of videos on YouTube on the subject, but few are really informative. Most are of people making it appear like a horrible experience. I watched several of them and picked out one that I felt was helpful. I just made this one up today. This is also my first try putting ginger into a smoothie. I’ve heard lots of people trying it, but I’d never had the courage before. I really liked it! 1/2 pineapple, 1 apple, 1/2 lemon, 2 carrots, romaine lettuce, 1 tbsp coconut cream, 1 tbsp hemp oil, 1/2 inch fresh ginger, almond milk, water. To blend it, I started my Vita-Mix on Variable speed 1 and added a couple slices of pineapple, then gradually turned it up to 10, adding more sliced up pieces of fruit and the romaine. Then I added the coconut cream, hemp oil and ginger and flipped it up to high for a minute or so to let it all smooth out. I also added some almond milk to thin it out some, and in the end decided to add some water as well. It actually was more orange than green because of the carrots…and the romaine was light in color…but it was very yummy! I ended up with about 40 oz. of the stuff, so I had a nice big glass for breakfast and another for lunch. In case you’re wondering about some of the ingredients, I’ve provided some info. You can read more by following the links. Ginger: According to the website fitnessandfreebies.com, in Eastern societies, ginger has always been known for its healing powers. They site it specifically for treatment of nausea and motion sickness, migraines, arthritis, blood clots and cholesterol issues. Growth retardation, weakness, impairment of vision and learning ability, motor incoordination, tingling in arms and legs, behavioural changes. Eczema-like skin eruptions, loss of hair, liver degeneration, behavioural disturbances, kidney degeneration, excessive water loss through the skin accompanied by thirst, drying up of glands, susceptibility to infections, failure of wound healing, sterility in males, miscarriage in females, arthritis-like conditions, heart and circulatory problems, growth retardation. The site also states that, adding these good oils back into the diet can virtually turn these symptoms around. That’s good news! I will say, however, that cold-pressed is what you want. If it is heated when it’s processed, it’s no better than all those icky cooking oils you find in the grocery store. I have a new love in my life. It is my new Vita-Mix 5200. When I received my Federal Stimulus check I deposited it, and then immediately went online to order my fabulous new toy. Check it out…isn’t it beautiful? I’ll be straight with you…they’re expensive. My total purchase came out to almost exactly the amount I had deposited – which is a lot of money for a piece of kitchen equipment – but they’re virtually indestructible and they come with a seven year warranty, so I felt it was a good investment. Besides…everyone in the raw food community I had talked to up to that point had said they loved theirs, so I was very excited at the prospect of having my very own machine, in spite of the cost. So I ordered the 5200 and got the package with both the wet and dry blades, just in case. I haven’t used the dry blade yet. That one is for things like grinding nuts or seeds into something like flour. You can also mix and kneed bread with the dry blade, but I’m not sure I’ll use mine for that since bread isn’t on my good food list. Green Smoothies My favorite is baby spinach with just about any combination of fruit. Add a little Hemp oil and you’ve got a great energy drink! Mango Sorbet Fresh organic Mango and some ice – it’s that simple! Chopped Carrots for Carrot Cake No more hand grating for me! 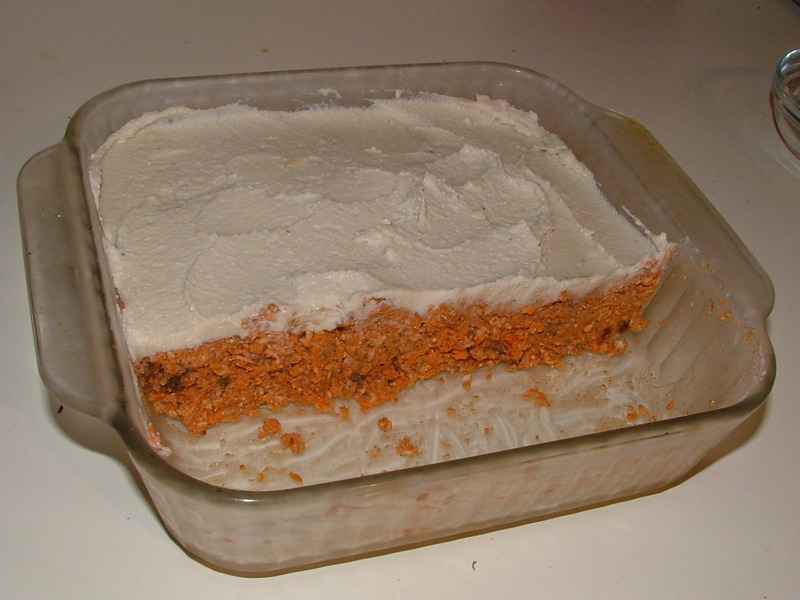 Refer to my blog entry “Raw Carrot & Orange Cake – It Rocks!” for notes about my experience and a link to the recipe. Chopped Cabbage for Salad The first time I tried chopping cabbage things did not go well. Then I waatched the DVD that came with the machine and learned the trick – it’s actually super easy! Vegetable Soup (Not raw, but very tasty!) I like to use sauteed leeks and onions as a starter, then add organic vegetable stock to complete the base. Chop up a variety of your favorite organic veggies, and you’ve got a great healthy soup! To give it a creamy base, put a cup or two of the broth into the Vita-Mix and give it a spin, then pour it back in with the rest of the soup. The Vita-Mix website even has a section for raw foodies. And there’s a community for Vita-Mix owners of all types to connect and share information. It’s called Vita-Village (corny, I know). I’ve had my Vita-Mix only a few months, but it is one of the most effective tools I have to support me in my raw food adventure. If you think you might like to try one, Vita-Mix offers a 30-day no-risk in-home trial…and you can get FREE Standard Ground Shipping if you click the banner above or use this link! If you prefer to upgrade your shipping method, the banner or link will get you a discount off of expedited shipping. Raw Carrot & Orange Cake – It Rocks! I have to pass this recipe on to you because it’s just so yummy! If you like carrot cake, but the “real” stuff is too sweet (or unhealthy) for you, this recipe is perfect! Not only does it not contain all those things I need to stay away from (flour, oil and sugar), but – believe it or not – it tastes very much like the real thing! I found the recipe quite by accident. I had been searching for a recipe for something like raw mushroom pate because I had these great looking portobello’s in my fridge and I was anxious to try something new with them. But the Universe had other plans for me. 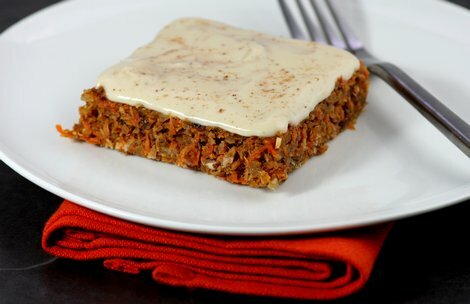 Somehow, as I was searching, I stumbled onto this great recipe for raw carrot cake! Now, understand, I’ve seen plenty of raw carrot cake recipes in my travels, but so far the pictures haven’t made me want to try them. This one is different. The picture above the recipe (see top of post) looks very appetizing, and the cake I made looks even better! I won’t post the full recipe here…you can pop on over to Raw Food Chef Russell James’ blog when you’re ready. But I will provide a couple of tips from my experience making it. First, I made it in an 8 x 8 baking pan, so mine came out a little higher than the one in the picture above. I’d say mine is about 1 1/2″ to 2″ high. I made the “icing” first, and set it in the fridge while I prepared the base. That worked well, and the base was plenty firm enough that I didn’t have to worry about tearing up the cake as I iced it. Last, I did not put it into the dehydrator, as the recipe suggests. I just finished the base and put the icing on it right away, covered it all and set it in the fridge. About 10 minutes later I pulled it back out of the fridge so I could have a piece (I couldn’t wait!). Getting that first piece out of the pan was a little tricky, but I managed to do it without mangling it too much. It really was no more difficult than getting the first piece of any kind of cake out of a pan like mine. And when I pulled the pan out of the fridge this morning to cut myself a piece for my lunchbox the rest of the cake was still in very good shape…no bleeding or falling over of stuff into the empty space I’d left the night before. That’s it! There are several ingredients, so there’s a lot of chopping to be done for the base, but you can chop each thing and dump it into the bowl right on top of the last thing you chopped, and then when you’re all done chopping, just mix it all together. Simple! It’s interesting how season changes and emotions can play into your overall feeling of well-being. For the past three weeks or so, I had been feeling achy and sore just about every day, and the degenerative disc in my lower back was inflamed to a degree that almost had me heading back to the chiropractor. I had a feeling the change in seasons was contributing to my achiness, but I know that food can trigger it as well. I had hoped the changes I made to my diet recently to manage the diabetes would help, but in this case it did not. While I did notice an improvement in my mood and overall sense of well-being after restarting on raw food, the achiness remained. Until about three days ago. On Wednesday morning of this past week, I woke up, got out of bed and walked…pain free…to the bathroom! It felt great! And I felt another positive boost in my attitude as well. My second theory is that I have recently been able to release some of my frustration over my job. I’m still working for the same company, but I’ve been moved into a position that I feel suits me better than my previous one. The atmosphere in this group is much more positive, and I feel I will have more freedom (and support) to dig in and make a difference. That’s important to me. So..even though the weather has changed again since last Wednesday, I still feel pretty good!